Salads—they can be an entrée, side, full course meal, and, with the addition of fruit, can even satisfy a sweet tooth. But the common thread in every variation of this versatile dish? Leafy salad greens, of course. If even their very name makes you wilt (I blame diet fads and every ‘90s iceberg lettuce salad you ever had) then read on. See, we’re all familiar with the convenience of a pre-mixed salad bag, but it’s worth being on first-name basis with the individual leaves. Knowing the properties of different types of lettuces can help you turn your salad into something altogether more interesting and substantial in taste and texture. But, let's be clear about something, the term ‘salad greens' is a little misleading: some types, like dark leafy greens and bitter lettuce varieties can really take the heat and be slightly sautéed, stirred through warm dishes, and—hello Romaine lettuce—grilled! Butterhead lettuce gets its name from its soft, delicate leaves. It has a mild flavor and like iceberg, is another common salad leaf across the globe. Flavor pairings: Use a dressing or vinaigrette with some kick to it and serve butterhead lettuce with more flavorful salad leaves like radicchio or add texture with loose-leaf lettuces like Batavia. Prep notes: Its wavy green leaves make for an attractive bed to serve on, but as a rule of thumb be sure to gently run butterhead leaves through a salad spinner first or pat them dry with a tea towel as the delicate leaves wilt easily. 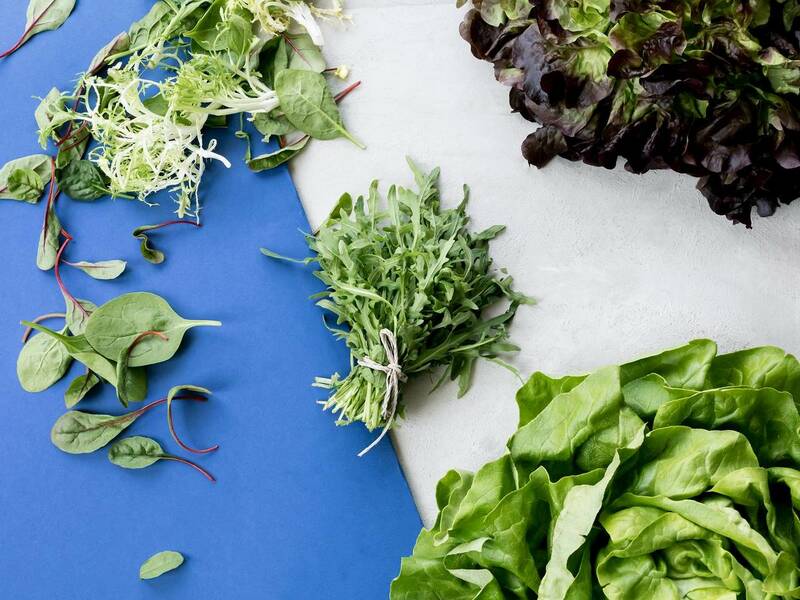 See the guide below for a complete overview of how to clean, dry and store all salad leaves. The crunchiest, juiciest (and some say ‘boring-est’) of salad leaves. Because of its high water content, iceberg lettuce is low in calories and nutritional value, but that doesn’t mean it’s worth leaving out altogether—when used in combination with other ingredients, it adds an incomparable hit of freshness. Flavor pairings: Since it’s not big on flavor, you’d do well to drizzle on heavier sour cream or mayonnaise-based dressings and vinaigrettes—try a mustard vinaigrette or classic ranch dressing. Prep notes: To diversify your bowl (and banish sad salad memories) mix iceberg lettuce with other salad leaves and herbs. There are no hard and fast rules, as the addition of any second textures will lift the iceberg to its…peak. The natural cup shape of the leaves comes in handy as a vessel (see these Shrimp Stuffed Lettuce Wraps?) and adds crunch to summer rolls, burgers and sandwiches, just to name a few. So-called because they grow in loose, leafy clusters, these lettuce varieties grow abundantly—which might be the reason they are near constants in supermarkets, salad mixes, and home-gardener’s veggie patches alike. We’ve grouped these kind together as varieties like oak leaf, coral leaf lettuce (or lollo rosso or bianco), red leaf lettuce, green leaf lettuce, and Batavia all have mild flavor profiles and can be treated similarly. Flavor pairings: Loose leaf lettuces add texture (if used alone, sometimes too much) and color to a salad, but their flavor is mild, so are best paired with punchier leaves, tangy dressings, and crunchy vegetables like cucumber and tomatoes. Prep notes: Given their delicate leaves and mild tastes, loose leaf varieties may all be treated like butterhead lettuce above—that is, handled lightly and used raw in salads. We at Kitchen Stories like to think of romaine as the classier iceberg. Its ribs are equally as crunchy, but there’s added texture, flavor and nutrients in the leaves. You’ll also find young Romaine lettuce on the market as ‘baby gem lettuce’. Flavor pairings: Like iceberg, Romaine does well with creamier dressings—try a classic Caesar dressing or Pan-fried Steak Salad. As it packs a little more in the way of flavor than the iceberg, basic vinaigrettes may also be used. Prep notes: Here’s where things get interesting—even with its high water content, but Romaine’s sturdy leaves do well on the grill, developing a nice char on the outside that sets off the crunch within. Try your hand at the controversial, but tasty, BBQ season Grilled Caesar Salad. Peppery arugula is not known for its subtlety—it’s always in the starring role whether used alone or in combination with other leaves. But would you want it any other way? Flavor pairings: Since the textural leaves pack so much in the way of flavor, heavy dressings aren’t necessary—try a sweet and tangy balsamic-honey vinaigrette and add sliced pear, chopped walnuts, and shaved parmesan to your salad bowl. Here's a Fennel, Arugula and Apple Salad for further inspiration. Prep notes: Because of its herbaceous notes and hard-to-wilt leaves, arugula can be used as a hefty garnish and complements Italian dishes (surprise, surprise) particularly well—so throw handful on a pizza, pasta or risotto before serving. Alternatively, blitz up the fiery leaves into a Pasta Verde Pesto. With their deep red stalks, baby beet leaves add a pop of color to salads and add a note of beet’s signature earthiness. Flavor pairings: Like beets themselves, baby beet leaves go well with salted cheeses like feta, nuts, and refreshing herbs like mint. Prep notes: As well as being mixed through your favorite salads, the leaves can be lightly sautéed added to warm grain salads. Baby spinach leaves are harvested earlier than mature spinach, giving them a milder flavor and more tender leaves. Flavor pairings: Use vinaigrettes to add a splash of balanced acidity to baby spinach leaf salads, as well as fruits like orange and apples. When cooked, like for regular spinach, nutmeg, onions, and garlic are all complementary aromatics. Prep notes: Baby spinach leaves have just as many uses as their older sibling and can be used raw in salads, sautéed for mere seconds until they wilt, or—just before serving—may be added to soups, stews, risottos, warm grain salads...you get the idea. Try a Superfood Salad or Linguine with Sage Butter and Baby Spinach. These delicate, buttery-tasting leaves grow in clustered sprigs. If you’re wondering about the name, it’s because the small leaves are said to resemble lambs’ tongues. Prep notes: The leaves are too delicate to be cooked, but may be used as a garnish to, or served alongside, cooked dishes like Lamb's Lettuce with Worcester Duck and Pomegranate or Goat Cheese Crème Brulée with Lamb's Lettuce and Apple. The toughest and most nutritious of the leafy greens, kale—which is technically a brassica and therefore a cousin to broccoli—requires a little softening up before it’s salad ready. Usually, it’s curly-leaf that you’ll see used in salads, while the less gristly, but equally sturdy flat-leaf Tuscan kale (also known as dinosaur kale or cavolo nero) features more in cooked dishes like pasta or soups. Prep notes: To prep the iron-rich leaves, wash, dry, and massage for about 5 minutes with lemon juice and olive oil to tenderize the fibers. Flavor pairings: The leaves add texture and a deep grassy flavor to salads, pairing well with creamy legumes like chickpeas, nuts, and fruit. Kale leaves can also be roasted into crunchy chips, blitzed into pesto, sautéed, or braised. Like anything under the endive/chicory umbrella (more on the confusing terminology below), you can expect bitterness. The curly endive adds crunch and bristly texture with its spindly leaves in a gradient of white to deep green. Flavor pairings: Curly endive can take on bold flavors and pairs well with proteins like eggs, roast chicken, pancetta, and cheese. A classic recipe is a French salad of curly endive sautéed with bacon and topped with a poached egg. Take that, Benedict. Prep notes: As the leaves can be on the bristly side, to improve the mouthfeel of curly endive, dress salads with warm or rich dressings which will soften the leaves, or alternatively, sauté briefly. Endive actually refers to a whole family of bitter leaves, but the pale, tulip shaped variant, originally from Belgium, often steals the title. Endive leaves are crunchy with a bitter-to-sweet aftertaste. Flavor pairings: For those who think bitter is better, endive is excellent in a salad with citrus, cheese or nuts (or all three), so take inspiration from our Clementine Endive Salad with Candied Pecans. The sturdy, canoe-shaped leaves can also be used as cups with a complementary filling, like in our Spaghetti Squash Stuffed Endive. Prep notes: To mellow out their bitterness, they can be quickly sautéed (we’re talking a matter of 30 seconds here) and deglazed with a little white wine, simmered whole, or even baked. With its crunchy white ribs and wavy green leaves, you’d be forgiven for confusing escarole for a lettuce. In fact, it’s another member of the endive family, though it’s less bitter than its cousins like radicchio. Flavor pairings: Classic pairings for escarole, which is a favorite in regional Italian cooking, are creamy white beans, sausage, and garlic. Prep notes: The outer leaves are where the bitter notes are concentrated, while the ribs are milder tasting. Like its cousins, escarole can be sautéed (say, with olive oil, garlic, and lemon zest. You'll notice its cooked texture is akin to pak choy), braised or brushed with oil and grilled. It’s perhaps most famous for its starring role in Italian soups, like the famous ‘Wedding Soup’ with beans and meatballs. Of course, you may also simply use it in a salad. Synonymous (and native to) Italy, radicchio is a crunchy, bitter lettuce leaf that you’ll most often see in its burgundy and white-veined variant—either in a tightly packed ball or with in oval shape reminiscent of Napa cabbage. There are in fact many kinds of radicchio, like the beautifully speckled Castelfranco (one to look for at your farmers market). Flavor pairings: Radicchio is often paired with the classic, Italian trifecta of gorgonzola, walnuts and honey. However, the sweetness of fennel, peaches and citrus also balance out the bitterness of leaves, so don’t be afraid to experiment. The other trick to levelling out its flavor is to use cream or cheese in the same dish, especially Italian varieties like ricotta, pecorino, and Parmesan cheeses. Radicchio also does well with cured meats, like in this Prosciutto and Radicchio Flatbread. Prep notes: Like endive, radicchio can be served raw in salads or cooked. When cooked, the bitterness will mellow out slightly. Try stirring it into risotto or pasta, like in this Orecchiette with Radicchio and Gorgonzola, or make use of its bright hue and add a pop of color when serving–try Spinach Dumplings with Radicchio. Any more leafy questions on your mind or personal tips to share? Let us know in the comments! For more tips on making expert salad, find out how to avoid commonly made salad mistakes and follow our complete guide to making homemade vinaigrettes, including the eight simple variations to know.